Construction is set to begin next year on the first phase of Richmond Hill’s portion of the GTA’s proposed lake-to-lake bike and walking trail. The town has been awarded $325,000 in provincial funding to help pay for the route, which will eventually link Lake Simcoe with Lake Ontario. The first stretch passes through Richmond Hill along Leslie Street from Hwy. 7 to just north of 16th Avenue and, in phase two, extends north to Elgin Mills Road. The Lake to Lake Cycling Route and Walking Trail will be an on- and off-road path connecting six municipalities in York Region (Georgina, East Gwillimbury, Newmarket, Aurora, Richmond Hill and Markham) and the City of Toronto. The town’s estimated budget for the first 2.5-km stretch that passes through Richmond Hill is $1.78 million, according to Maria Flores, manager of environment strategy and sustainability. The funds granted by the Ontario Municipal Cycling Infrastructure Program will help pay for construction of phase one and is jointly funded by Richmond Hill and York Region, with each municipality contributing an estimated $890,000 towards the project, Flores said. Flores said the town will apply for further funding from the province to help pay for phase two. The Richmond Hill portion of the Lake to Lake route is envisioned, for the most part, to be an in-boulevard (separated from the road) multi-use path along the west side of Leslie Street and Hwy. 7 in the south to Bayview Avenue and Bloomington Road in the north. 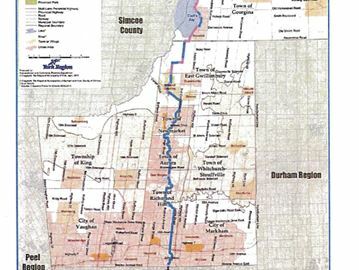 While the majority of the route runs along Leslie Street, 19th Avenue and Bayview Avenue, specific portions of the route will also connect or run through sections of the North Leslie greenway lands, the Oak Ridges Corridor Conservation Reserve, and the West Gormley neighbourhood, Flores said. Phase one construction is expected to begin in 2017 and is expected to be complete in spring 2018. The 121-kilometre Lake to Lake Cycling Route is proposed to run for 92 kilometres in York Region and 29 kilometres in Toronto. Once construction is complete, the resulting pathway will be maintained by the town at a cost of approximately $3,000 per year, according to a staff report presented to council in July. We really liked Kathy. She was always around when we needed her. She made all efforts to answer our questions & have answers for us. She also found us our Mississauga selling agent, who was also great! Thanks again, Kathy!